I aint been about much, had alot on, becoming one of those dad things etc, but been trying to keep up with things where I can. Anyway today I managed to get a working micro coil on my cobra using drill bit and pulse methods with an unoxidized SS wick (not sure of the type of SS) combined and it seems to be going quite the thing and afaik the micro coils seem to last a nice time. I was all excited when it all came together and wanted to tell you all of me findings, but looks like I am still a bit behind the vaping times lol. It's a good way to setup gennys mind and looks the nuts as scott would say. Any questions I'll be happy to answer them. yeah, micro-coils work well on genesis-style atomisers. 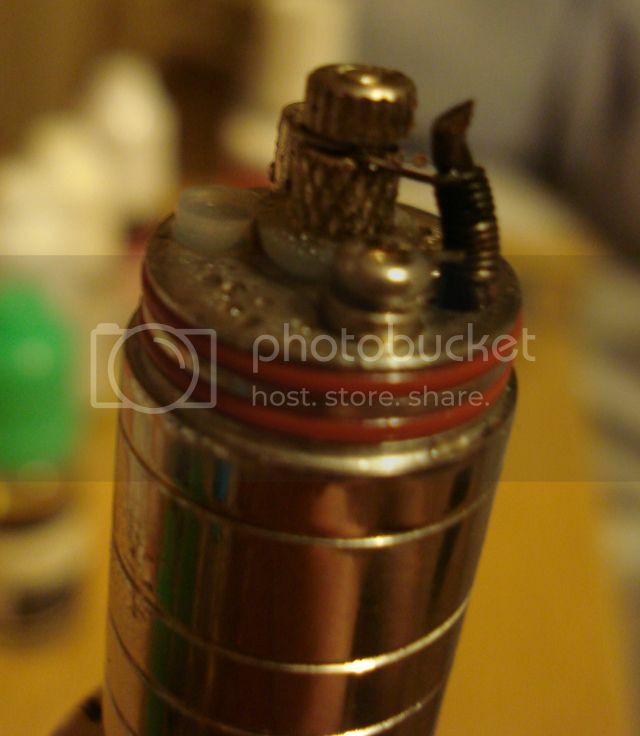 I was most intrigued when Rocc first posted those links to the youtuber showing micro-coils, some time back. In fact, on my AGA-S, which has almost no space in which to work, they're the best thing since ... er ... ever. I had better results with 0.5 but I find it takes too long to heat up, so it seemed worse. I'm still trying with 0.3 but my 0.4 disappeared probably into the bowls of the boat! I assume .2mm wouldn't be any good for making microcoils then. I have two dripping attys coming from fasttech and would like to try these coils. I have been stuck now ( 2 years ) with the normal coils. and want to move on a little. Your .2 mm wire will work but you'd have to make fewer wraps unless you want a higher res. I think thicker wires better because you can make more wraps which gives more surface area of wire to heat up and create vapour. When working with thinner wire I find the pinching can throw the coils out of alignment which makes getting your cotton through tricky. If you only have .20mm wire have you thought about twisting 2 strands together then wrapping your coil? We're not bored Nick, just waiting to see your "I cracked the micro coil" post. The blowtorch will certainly help. Hold the coil in tweezers and zap it and pinch, hold until cooled, rinse and repeat a couple of times. Zapping the wire prior to wrapping will take out some springiness and also help. Without a blowtorch you can mount the coil and fire it up then cut the power and pinch but be careful of creating shorts obviously. I usually work this way making up a coil I'm familiar with. When trying new coil builds I generally torch. I've found 30 & 28 gauge the best so far. I think that's .25 and .30. I have some 27 gauge too but waiting for my trident clone before trying that out. The trident I believe has nice wide slots which makes mounting heavier gauge coils a breeze. I'll also be trying the tinman with .8 ribbon on that dripper. Note: best set up yet on the pure, it's rumbling away perfectly . Having experimented with microcoils on my gennies a lot I have now settled on 28 gage wire microcoil with a cotton wick, as some describe the auto dripper. Flavour/vapour are superior imo, and easy to maintain - pull the wick out, burn the coil red hot, insert new wick and saturate it - pulls the juice from the tank nicely. So def recommend trying!